This week we take a look at a new spin on an old sport, the debut of a new alcohol policy in Jefferson City and a weekend long art show in Columbia. Most people associate polo with grassy fields and sleek horses. But why not parking garages and old bikes? KBIA’s Caitlin Oliver shows us a wilder, faster take on the traditional sport– Como Polo. Jefferson City bars were cheering Thursday night at the debut of the new Festival District. The district allows citizens to consume alcoholic beverages in city streets legally. The alcohol policies will go into effect in parts of the city where special events are held. Ecco Lounge co-owner Sally Powell thinks the new district will draw crowds while promoting local businesses. Events within the district are usually held when family-friendly stores in the downtown area are closed. 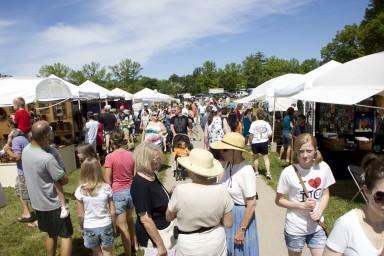 Art in the Park, Columbia’s annual art show, is taking place this weekend. Now in its 53rd year, the show will feature 110 artists from Missouri and beyond. In addition to fine art, there are crafts, jewelry, musical performances and even magic. I sat down with Columbia Art League executive director Diana Moxon about what’s new at this year’s show—a brand new venue called the young collectors tent. Art in the Park is taking place Saturday (10am-7pm) and Sunday (10am-4pm) at Stephen’s Lake Park– rain or shine.